The Emergency Information & Procedures for Normandale Lake Office Park are detailed in the sections below. Anyone who works within the Park is encouraged to review this information so they can be prepared for emergencies that may arise during the workday. 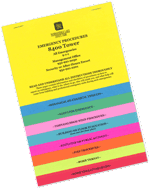 A color-coded Emergency Procedures pamphlet is also available to every employee. Please take a few moments to watch the Emergency Evacuation video below—it may help you in case of an emergency. Every Tenant should have an assigned Fire Warden or two who attend our bi-annual emergency meetings, and they are responsible for coordinating and directing employees where to go in case of an emergency. Everyone is encouraged to practice evacuating your offices during emergency drills, which are held twice a year in conjunction with the meetings. This pamphlet contains reference information and checklists of procedures on how to report an emergency and what to do, who will assist you, and what help will come from building and professional emergency units during such emergencies. There is a biological or chemical threat. Location (building, physical address, floor and suite number). Elevators are one of the safest modes of transportation there is; however, they occasionally malfunction. Press the HELP button or open the PHONE door and press the button. Give the floor level if possible. Give the elevator number located in the car or inside the phone door. Talk by speaker telephone with Central Station. Central Station will secure assistance. Someone will be in touch with you via speakerphone, speaker system, or from outside the elevator. Passengers will be assisted as soon as possible. By definition, a Tornado/High Wind Warning is an alert by the National Weather Service confirming a sighting and a location. The Weather Service will announce the approximate time of detection and direction of movement. PUBLIC WARNING – A warning will come over radio, TV or five (5) minutes of a steady blast of sirens by Hennepin County Civil Defense Warning System. Your Emergency Warden or alternate should monitor the weather and make the decision, if necessary, to take action. Seek shelter in the stairwells or restrooms, as they are the safest areas, followed by corridors and interior offices. Sit down in the corridor and protect yourself by putting your head as close to your lap as possible or kneel, protecting your head. Remain in the enclosed stairwell. Do Not use the elevators. Do Not go to the first floor lobby, atrium, skyway or outside the building. Seek protection under a desk. The Building Management will give an all clear. 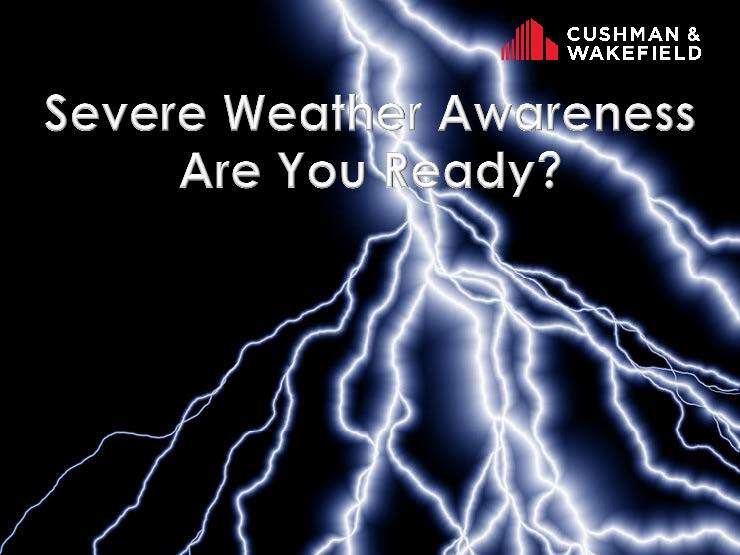 Below is a link to a Severe Weather Slideshow which summarizes what to do in case of severe weather. Building or floor evacuations will either occur as a result of automatic fire alarms or overhead public address communications when conditions warrant. It is the policy of the Management Office to consult with local authorities prior to evacuating floors or buildings. The Management Office will attempt to communicate to explain the circumstances. In most cases, however, the decision to evacuate is left to each tenant. If conditions escalate warranting a mandatory evacuation, the Management Office will direct this action and administrate an orderly evacuation of the building. It is the responsibility of each employee to be familiar with the evacuation plans. It is also the responsibility of each employee to know their company Emergency Warden as well as their alternate. Each employee should be familiar with the locations of the stairwells and procedures for evacuating any handicapped employees. Emergency Call Buttons are located every fifth floor. …follow the instructions of your individual company Emergency Warden or alternate. …close the door of your office as you leave. …form evacuation lines – two abreast. …use the enclosed stairwells for evacuation (there are two stairwells per building). …know the locations of the stairwells. …keep talking to a minimum. …use handrails in enclosed stairwells. …listen for instructions and follow them. …be ready to merge with other people evacuating the building. …follow the method for evacuation of handicapped individuals, which will be determined by your individual floor warden. …watch for the Fire Department ascending the stairwells in the event of an emergency. …go to the elevators – they may not respond. …return for coats, purses, etc. once you have left your area. Call 9-911 and then call the Management Office at 952-921-2050. Building’s address below (this is the address for police & emergencies). Floor of building and location of accident or illness. Type of injury, illness or symptoms. Do not move the injured or ill person. Try to make them comfortable. If possible, have someone meet the emergency units at the elevator on your floor. Emergency units will respond, and responsible building personnel will be notified by radio. Our building staff will assist emergency personnel to the injured or ill.
Fire Rescue Squad and/or ambulance will be with you shortly and administer medical assistance or take the ill or injured person to the hospital. 1. Call 9-911 and then the Management Office at 952-921-2050. Any details of fire emergency. …use enclosed stairwells only, as directed by your Emergency Warden, alternate or Fire Department Representative. …take short breaths if caught in heavy smoke. The air is better near the floor so breathe through your nose and crawl to the exit. …familiarize yourself with your company’s emergency plan and personnel. …attempt to fight the fire. Professional help is on the way. Call 9-911 and then the Management Office at 952-921-2050. Give the operator your name and the company name. Building’s address below (this is the address for police & emergencies) and floor location. Commence a search of your area in accordance with your company’s procedures to determine if any strange objects are present. DO NOT TOUCH SUSPICIOUS OBJECTS IF FOUND. Report to the building personnel on scene the results of your search, or report results to the Management Office at 952-921-2050. Below is a checklist and information to record should you receive a bomb threat. Keep this available for authorities. Police are notified/dispatched by 9-911. Building personnel perform a building common area search. Police or Bomb Squad contacts and questions the person who received the bomb threat. A building evacuation MAY take place. The building management will give an “ALL CLEAR”. If you receive a bomb threat call, remain calm. If possible, record the call. Advise the caller, if you can, that the detonation of the bomb may kill or injure innocent people. Obtain as much of the following information as you can. 1. When is the bomb going to explode? 2. Where is the bomb? 4. What kind of bomb is it? 5. What will cause it to explode? 6. Did you place the bomb? 8. Where are you calling from? 9. What is your address? If the voice is familiar, whom did it sound like? Report the call immediately to your Supervisor. Bomb threats and searches will be managed in accordance with the Bloomington Police Department Policy. In the event of a power failure in your space or in the building, call the Management Office immediately at 952-921-2050. The building’s emergency generator is automatically activated during a power failure to provide power to life safety related areas such as stairwell lights and exit lights. The Management Office engineering staff will investigate the issue immediately. Open draperies and raise blinds to let in all available ambient light. If you are trapped in an elevator during a power failure, DO NOT PANIC. Push the button – it will automatically call our Central Station Monitoring System – and report that you are trapped. The elevators will cease normal operation, but will in sequence; slowly make their way down to the first floor where the doors will open. Do not force open elevator doors or try to escape through the roof hatch. CALL 9-911 WHEN IT IS SAFE TO DO SO! Contact your building Management Office or human resources department for more information and training on active shooter response in your workplace. Provided to us by the U.S. Department of Homeland Security. Two stairwells are located in each building. Tenants should note the location of the stairwell nearest their office for emergency use. Stairwells are pressurized so that in the event smoke is present, fans will activate to clear the stairs for safe exit. For this reason, all stairwell doors should remain closed at all times. Press the play button to view our video.